Intranet Software for Healthcare Companies. If you're looking for easy-to-use intranet software for your Healthcare company, then you've come to the right place. Communifire is an integrated set of tools that you can use to connect your people, organize your work, and get things done. Imagine the ease of collaboration. The free flow of conversation. The sharing of knowledge. This is your intranet powered by Communifire. "We've fallen in love with Communifire and couldn't imagine the workday without it. It manages all communication internally and with our customers, helps us organize our files and documents, and keeps everything organized. But what's really cool, is that everyday we find new ways to use Communifire. It's such an awesome platform." You want Social Intranet Software that makes it easy for you to organize your people, documents, and data. That's a given. But what about one that enables you to do more? Imagine a new kind of intranet. An intranet that your people actually find value in visiting. An intranet that unites your employees, energizes your workplace, and is ridiculously easy to learn and simple to use. 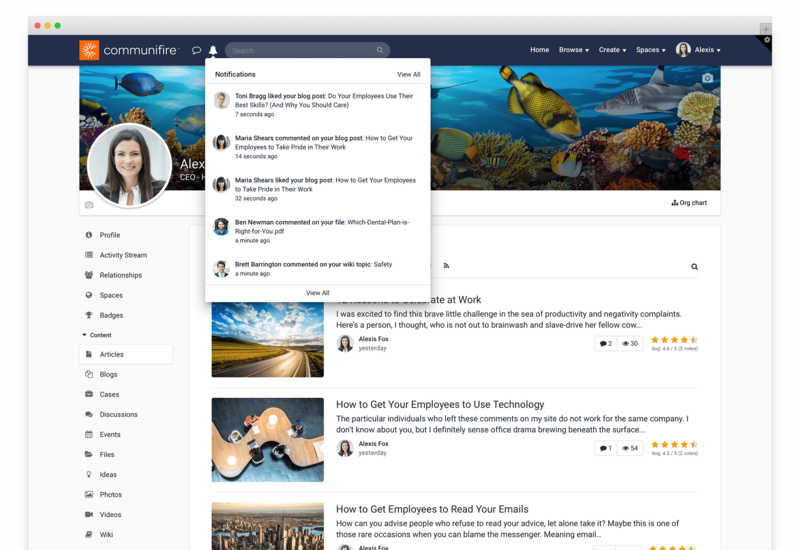 Communifire takes the concepts of old and clunky intranets and transforms them into an easy-to-use collaboration, communication, and knowledge management platform. Your healthcare professionals may be spread out, but you work together on one platform, accessing a centralized knowledge base. Manage schedules, treatments and hospital workflows. Share valuable insight and experience. Communifire provides a robust collaboration platform for your healthcare professionals to work together effectively. When your healthcare professionals log in to Communifire, they'll have access to your company homepage. This page can be customized to offer significant value for your teams and workforce by adding necessary company news feeds and relevant information about departments, groups and projects. You can even add feeds from your popular applications and highlight important updates for everyone to read and review. Your homepage offers you a way to get your employees' attention and give important updates, while also building community and sharing progress, achievements and upcoming events. Make a homepage that your healthcare professionals and employees love. Add your logos, branding and other personalization elements. If you have a specific look and feel in mind, we can assist you in developing that. We'll brainstorm your options and let you know what's possible in terms of functionality and design. Then if you need more features, we'll add them free of charge. You've got multiple healthcare departments - each with its own major projects, concerns and developments to keep track of. Form groups easily with Communifire and create dynamic workspaces online so you can collaborate effectively on your departmental issues and projects in one centralized location. You can create community around specific content as well. Members of your team can share insight, ask questions, collaborate and get connected to each other. You can easily add or remove any members at any time. Manage your projects easily and keep people connected and communicating with conversations within context of issues and projects ahead, because Communifire is the perfect intranet software for healthcare companies. When you first set up your online workspaces, you'll discover that Communifire has many features you can utilize ranging from blogs and discussions to file sharing and events. Control the privacy and moderation settings for your social intranet software and personalize them with logos and names. Then invite your people and set permissions for access. Members can share files, learn and gain insight and collaborate. You can also share regular news feeds to keep people up to date on the latest developments in any area. Make your online workspaces your daily productivity hubs where your community members can get their best work done. You can also tap into other Communifire features such as shared calendars, task management, document management and publishing tools. Create a company directory that goes beyond simple name and job titles. Communifire's company directory provides rich insight into each member and shows connections between members. Every member has a user profile with a photograph, name, and contact information. Each member profile is also equipped with publishing tools and has a realtime activity stream similar to Facebook's Wall where he or she can share dynamic content that includes things they are working on and news, including blogs, photos, videos, links, events and status updates. Any member can also invite other members to discuss an idea by simply mentioning people (@johnsmith for example) and using hashtags (#healthcareadmin). You can also easily see and identify experts using the company directory. Each member profile also shows an index of the content they've created, their relationships, and the spaces and groups they are a part of. This makes it easy for you to identify experts to collaborate on projects, answer any questions and connect people to get work done. The company directory and employee profiles also make your company more human to your workforce especially if they are spread out across the globe. Keep everyone connected and engaged. Build bonds between employees and management, doctors and administration and more. See your productivity increase and your employee retention rise. Every member has access to a personalized Activity Stream to share relevant updates and insight that includes images, video, links, content, news and events. You can also publish content for your company in a company news feed that you tie into the HomePage. Keep information flowing so your team is informed and engaged. Skip the hassles of dealing with email chains to spread information. Every member can also add information tied to their projects, departments and teams as well as personalize their own activity streams to just contain the information they need. Keep everyone engaged and share your own insight by adding comments or simply pressing the "like" button similar to Facebook's functionality. Engage your team socially while providing them with important updates and announcements. Share, create and update documents easily with Communifire's secure document management system. Every day you have a barrage of healthcare documentation to go through. Make this process easier. Send documents for approval to necessary admin and departments with associated tags and tracking features enabled so you can follow up to ensure they have been completed. Search for documents easily by content, author, tags, discussions and project names. Find documents and all related conversation threads on any given topic. Review different versions of documents via Version Control and update documents at any time. Access documents from any mobile device or browser anytime. Preview documents prior to download. Add your feedback via the "like" button or commenting similar to microblogging. Manage your documents in one place effectively. Every healthcare project has numerous phases, deadlines and tasks associated with it. Task management is essential to completing projects and meeting expectations. With Communifire, you can easily assign and manage tasks for yourself, your healthcare employees and your team. Plan out project phases and due dates. Ensure that your teams are working productively on the right tasks by logging in periodically and seeing progress. Check off work that has been completed, assign or reassign remaining tasks. Add new tasks for the next project phase to keep up momentum and ensure that you meet your goals on time effectively. Build relationships with your workforce, your partners, your patients and your clients when you're finishing tasks, moving forward on projects and delivering measurable results. With Communifire's personal and shared calendars, you can stay organized and on top of things easily and plan out your workweek so you get the most out of it. Simplify your daily operations with Communifire's calendar management. Adding appointments, meetings and events is easy and just involves a few clicks. You can add items to your personal calendar and then share events or meetings with others in your healthcare team. You can also invite others outside your healthcare organization to attend meetings or events with invitations sent out right from the calendar or linked to your email. You can also share entire calendars if needed. With Communifire, it is easy to plan out events for both your personal and group calendars. You'll find that Communifire's calendar is a robust, attractive alternative to Outlook calendar and Google calendars. It's easy to use and highly functional. You can update and change events or other items on your calendar by drag and drop to change time slots or simply clicking on events and renaming them. Personalize categories with colors and names for quick identification later. Get a quick overview of what lies ahead on the radar so you're prepared. Information access is the first part of the equation. The second is finding the information you need. In the world of healthcare, this may include finding doctor insight, patient history and relevant documents pertaining to any topic or concern at hand. Pulling up this information through email and file storage can take forever and still be ineffectual or incomplete. Communifire makes this easy. You can search for and find the information you are looking for on any given topic with Communifire's Contextual Search function. Pull up all the documents on that topic as well as relevant conversations, workforce insight and other files. Get the information and insight you need instantly so you can be more knowledgable, make better decisions and provide better patient care. Connect your healthcare professionals so they get the valuable information they need instantly. Keep your entire team connected and informed. Create groups to collaborate together using online workspaces. Invite healthcare partners. Scale up or down. Work together productively to spark ideas and get things done. Avoid the limitations imposed by communicating via email. Work from a centralized platform and accelerate communications. Raise productivity. Organization is the key to running your healthcare company smoothly and professionally. Keep everyone informed and engaged with access to relevant information on time. Stay in touch with your doctors and nurses from anywhere using any browser or mobile device you choose. Pull in information from your research and admin teams so that you can provide patients with the best experiences and care. Look for any file in Communifire's centralized knowledge base and you'll pull up all related conversations and documents. Get the information and insight you need, when you need it. You've got seasoned doctors, nurses, and admin who know a lot of important details necessary about specific cases or scenarios. Unlock that insight within context. Encourage your healthcare team to share their opinions and ideas. As they are valued, they will participate more. This in turn, translates to better patient and customer service.